1. Nothing says 4th Of July better than dripping, oozing, shiny, glistening barbecue sauce…both on the grill and splattering all over people’s faces and clothes as they try to inhale the various sugar sauce doused proteins, starches, veggies, and fibers. Try to use a wide aperture and get in close on the drips, the shine, savor the details of those barbecue-sauce mustaches, especially on the wives and girlfriends. I recommend using Aperture Priority if you're using a camera with manual controls. That way all you'll have to focus on is the focus, and the camera will do the rest. 2. Nothing else says 4th of July barbeque better than dripping, oozing, meat on a grill. The same idea as #1, but come in at an angle, add some energy to the shot. Straight from above, or perfectly perpendicular might be good for Instagram, but if you want to get a solid, professional looking image, use a wide aperture for minimal depth of field, perhaps around the f3.5 - 5.6 range, which is a good balance so the background doesn't get so blurry you can’t tell what it is. Move in as close as you can without fear of melting your lens (if you have the luxury of a good zoom, a solid 12-18 inches away from the heat source would be best and zoom that sucker in. However, beware, on most zooms, the more you zoom, the smaller your widest aperture will be, which means that the f-stop number will rise and you’ll get more in focus unless you’re lucky or wealthy enough to have a fixed aperture zoom). 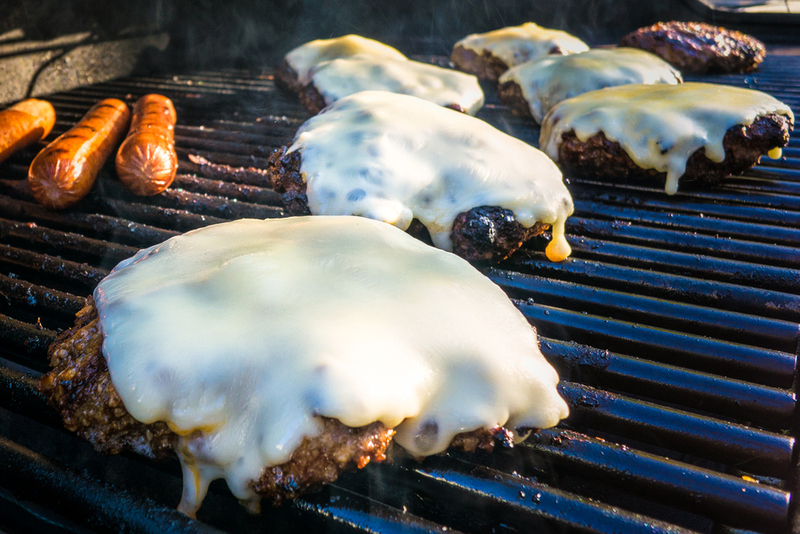 Focus on a small part of the burger, perhaps right where it meets the grill and the fat is dripping off into the charcoal filled ether, or the corner of the cheese melting off the side of the meat onto the charcoal coated grill, allowing the rest of the scene to melt out of focus behind it. Even after eating 3 of the suckers, that picture will convince even you to inhale a fourth. 4. The Chef! Never forget them! Keep an eye on the cook(s). Often times, especially as the afternoon gets longer and a few libations have increased the enthusiasm over the grill, lazy eyes and slurred speech and dropped steaks followed by a ‘god made dirt and dirt don’t hurt’ grumble begin to dominate the festivities and make for the most memorable of images, especially since, well, your job is to make sure they remember their most embarrassing moments. 5. By all means, get brewed up, it is a celebration after all, but by NO means forget your camera anywhere near the barbecue. That celebration will turn into the breeding grounds for a whole new American revolution. Ok then…go get your gluttony on! And remember to come back and share the best of the best and worst of the worst with a link in the comments. Needless to say, I’d absolutey LOVE to see them.